Michael May: Fourth Chair Army Invasion | Convince Me! So, I've got a new podcast project. I know, I know, but it'll only be a few times a year and not much trouble to fit into the schedule. What's going on is the Nerd Lunch fellas are cutting back to two, actual Nerd Lunch episodes a month. The other two weeks are filled with spinoff shows, Down the Rabbit Hole and The Chap Report, so I floated them the idea of letting their Fourth Chair Army (of which I'm pleased to be a member) take over the show anytime there's a fifth Tuesday in the month. They went for it and Fourth Chair Army Invasion is a thing. 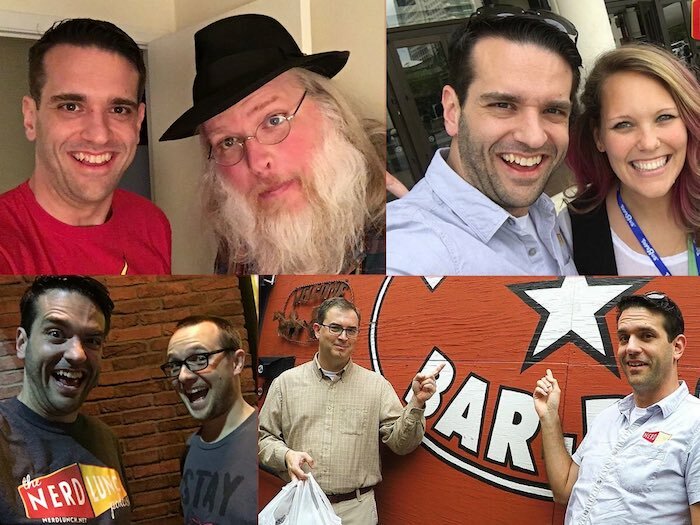 For the first episode I asked Liz Twachtman, Mike Westfall, and Evan Hanson (all of us appearing in the collage above with Nerd Lunch's Carlin Trammel) to join me in something I called "Convince Me." Each of us introduced another panelist to something they’ve never tried before to see if we could convince each other about the worth of The Americans, Buffy the Vampire Slayer, Attack the Block, and Meet the Robinsons. From this to reviewing Solo on Nerd Lunch back to back, you just cannot quit podcasting Michael! For you it's a a marathon not a sprint. This was a fun episode to listen to since I have mostly positive thoughts on the media you reviewed. They say the best podcasts are the ones you wish you could join in! So with that in mind I've already started brainstorming "what could I make Michael watch that he wouldn't have seen on his own that he'd bring an outside perspective without being immediately dismissive." I may just something. We'll see. That's one of my favorite things about Mystery Movie Night: that we get to make each other watch stuff. Is there an underappreciated TV show or comic or something that you'd make people watch or read? I remember back on the Geek Fallout show we did an episode called "Needs more Love" we're we discussed properties that were good but didn't become big hits but could have been with enough time to develop a following fan base. I recommend some short lived cartoons like "My Life as a Teenaged Robot", "The Modifyers", "Cybersix" and "Megas XLR" as well as some short run comics like Image's "Wildguard" or the newspaper comic "Ink Pen". I'm sure I also mentioned the movie "A Patch of Blue". If I were to choose something specificity for you I might choose the pilot episode for My Little Pony: Friendship is Magic because it's so outside of your sphere but as a good ensemble cast. Otherwise knowing your love for giant robots and monsters I might pick an especially weird episode of Power Rangers just so you could say you'd seen but were no closer to understanding it. As for myself there a plenty of non-genre TV shows that people rave about that I just haven't had the time to watch that it'd been fun to check some of the bigger ones off my list of someone were to give me a gunpoint review like this. I think you've mentioned Patch of Blue to me before. I finally watched that this year based on your recommendation and liked it. It's tough to watch Shelly Winters' excellently unpleasant performance of course, and I don't love the ending, but it's a lovely movie about the power of kindness and I'm all about that.